Kale Chips - A recipe from Savor California, the online showcase for extraordinary gourmet foods and beverages from California. Recipe courtesy of Athea Merredyth. Fold the kale leaves along the stems and cut the leaves away. 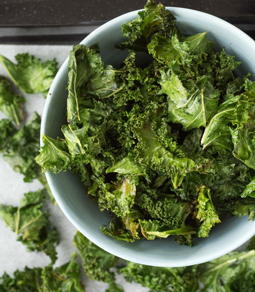 Tear the kale into bite-size pieces. Mix the Caged Heat with the olive oil. Toss the kale in the mixture. While hot, sprinkle with sea salt, if desired.